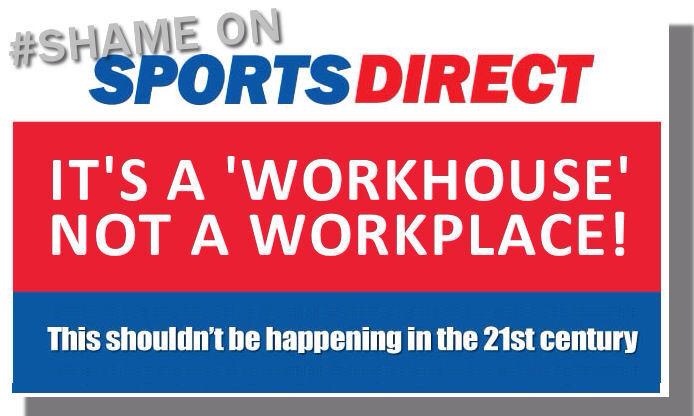 A review by Mike Ashley into the use agency workers at Sports Direct will be nothing more than a public relations stunt if it fails to end ‘Victorian’ work practices at the retailer’s Shirebrook warehouse, Britain’s largest union Unite warned today (Friday 18 December). The review announced by the Sports Direct board today, follows a Guardian investigation which found that extra, unpaid time taken for “rigorous” compulsory searches meant workers were paid less than the minimum wage. Likening working conditions in the warehouse to a ‘gulag’, the investigation also found that workers were being ‘docked’ wages for arriving as little as a minute late to work. 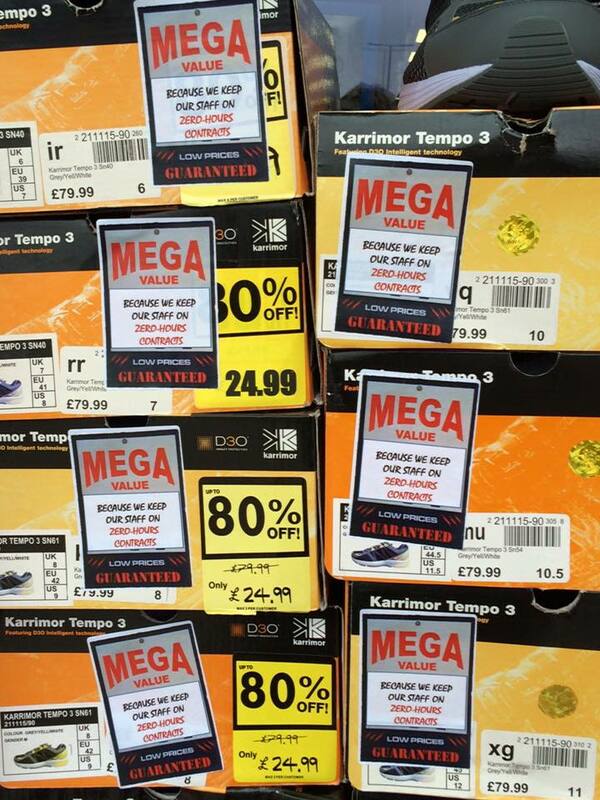 Unite regional officer Luke Primarolo said: “Shameful ‘Victorian’ work practices have no place in modern Britain and this review should not deter HMRC from investigating the non-payment of the minimum wage to agency workers at Sports Direct. 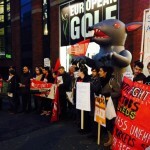 “Unite has repeatedly raised concerns with the board and Mike Ashley directly about the use of ‘Victorian’ work practices. We look forward to participating fully with Mike Ashley’s review and to working with Sports Direct to eradicate the mistreatment of workers at its Shirebrook warehouse. “If his review is to be taken seriously then it has to have concrete outcomes, such as restoring dignity at work by moving agency staff at Best Connection and Transline workers onto permanent contracts. 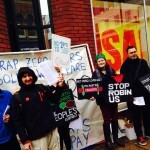 Yesterday’s Sports Direct national day of action saw community action, shareholder action and social media combine to highlight ‘Victorian’ work practices at Sports Direct and spark a significant shareholder revolt at the company’s AGM. With protests from Truro to Newcastle and a demo outside the AGM at Sports Direct HQ, the day received wide spread coverage in national and regional media. The campaign continues … But in the meantime here’s a small selection of some of the media coverage. 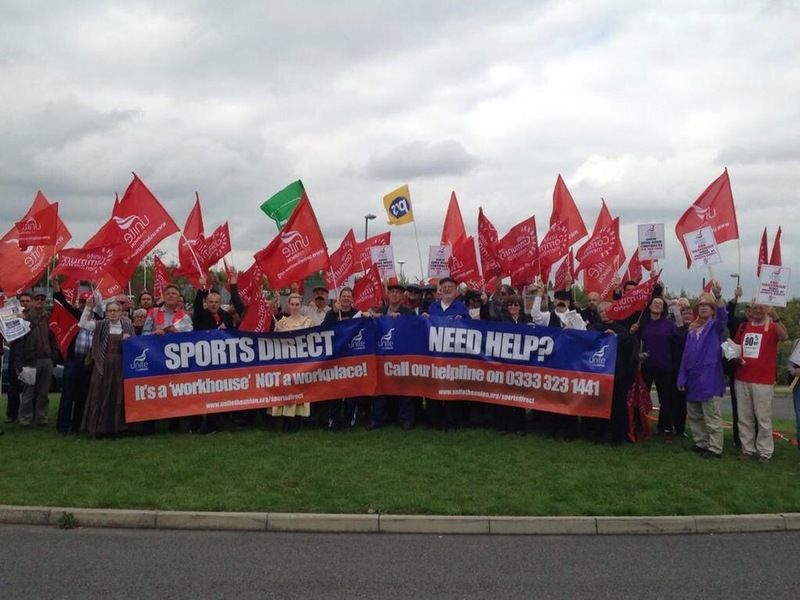 Tomorrow Unite members will be protesting outside Sports Direct Annual General Meeting demanding an end to ‘Victorian’ work practices at the retailer’s Shirebrook warehouse and pays a real living wage. 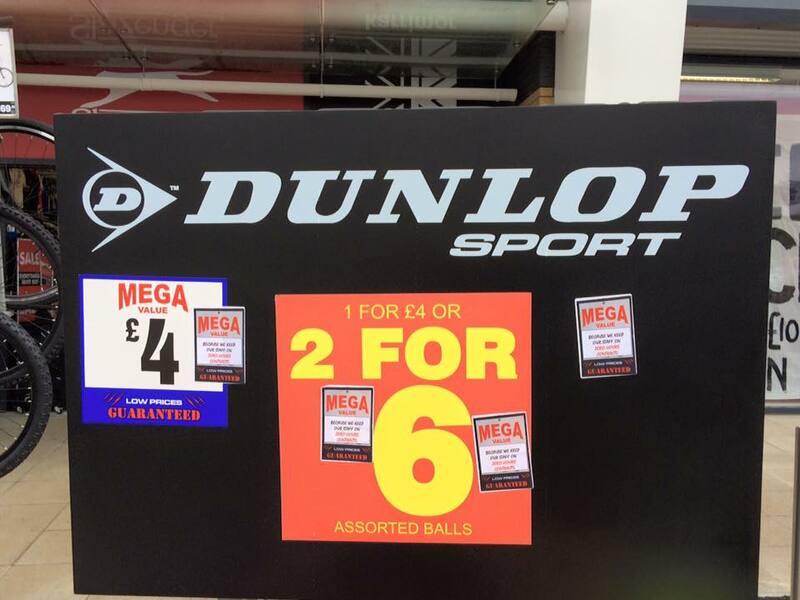 The protest is part of a national day of action outside over 25 Sports Direct stores across the UK. It comes amid a shareholder revolt over the company’s governance and employment practices resulting in calls for the Sports Direct chairman Keith Hellawell to stand down at tomorrow’s AGM.Unite has launched an online petition calling for an end to ‘Draconian’ working practices and an end to Sports Direct’s reliance on zero hours contracts. 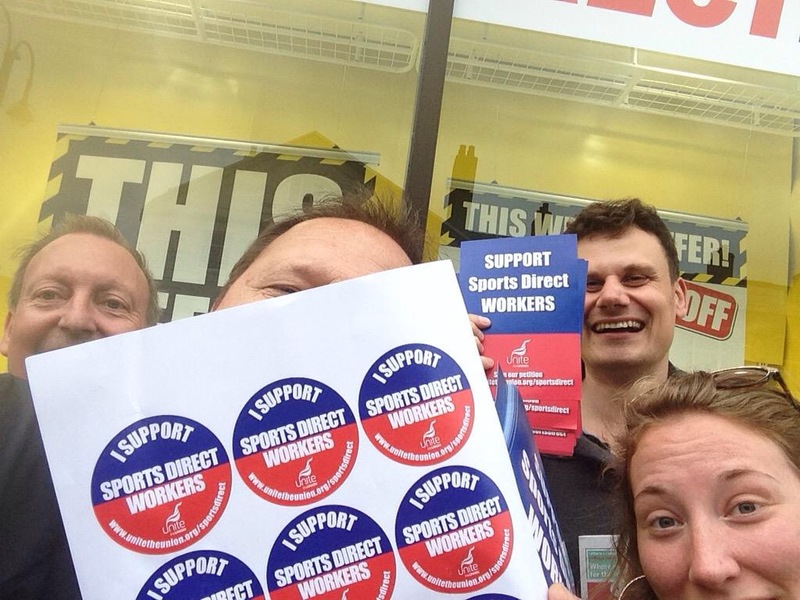 Please help us put pressure on Sports Direct – sign the petition here, share it with friends and family on your Facebook or if you Tweet, retweet. 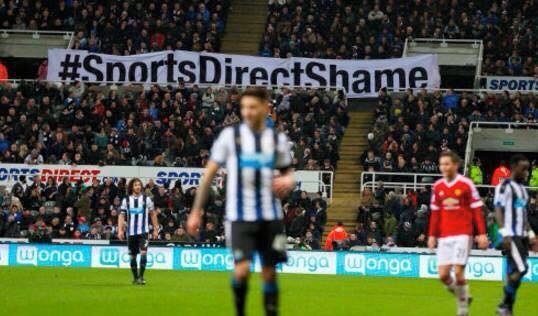 The hash tag is #SportsDirectShame – here is the link to the petition. 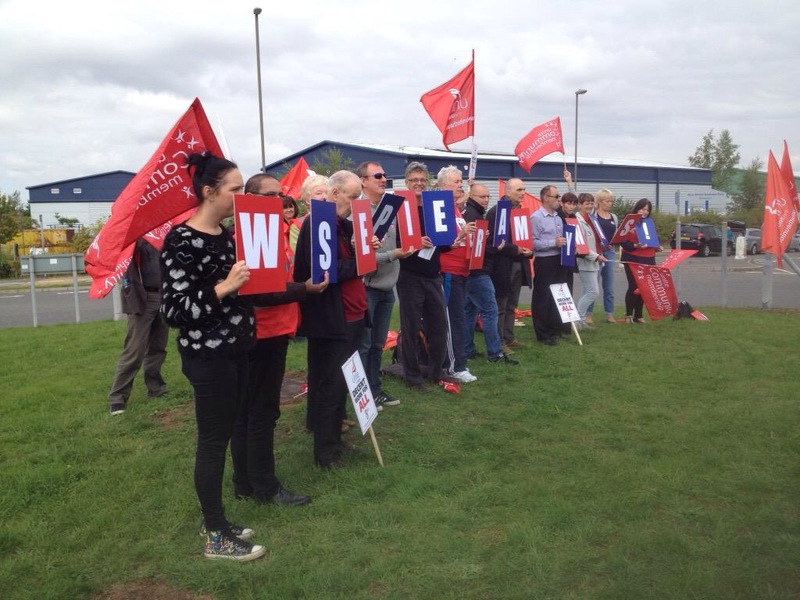 Britain’s largest union, Unite urged the highly profitable Sports Direct to clampdown on ‘Victorian’ work practices today (Friday 7 August), as it submitted a pay claim on behalf of workers at its Shirebrook headquarters and warehouse in Derbyshire. 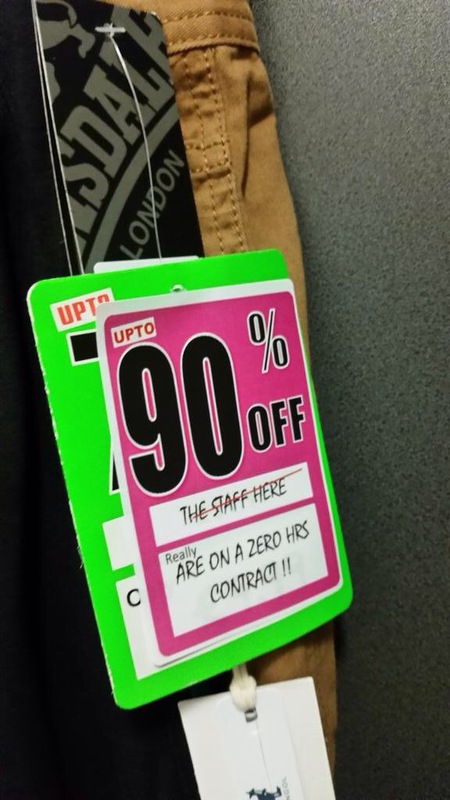 The union, which represents permanent warehouse workers on the site, is calling on Sports Direct to move zero hours agency workers onto permanent contracts and pay the real living wage of £7.85 per hour. 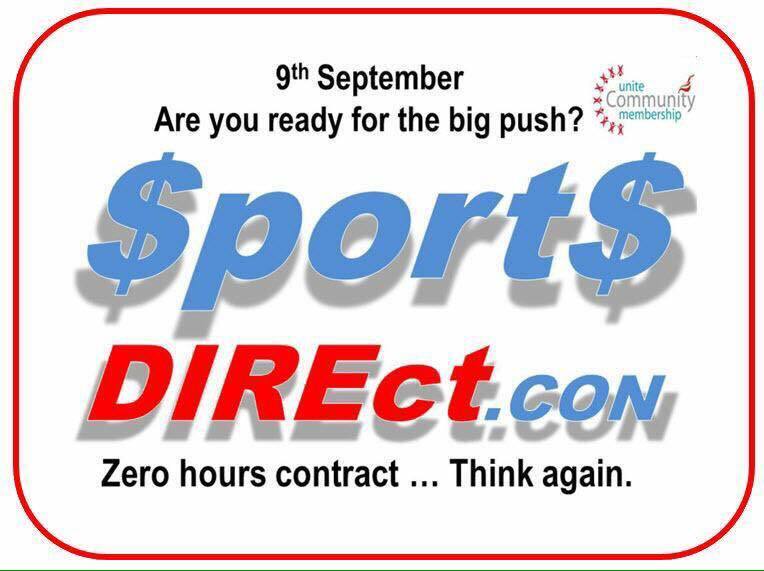 Unite estimates that only 300 out of the 3,000 plus workers at the Shirebrook depot actually have permanent contracts with Sports Direct with the majority on zero hour contracts with two employment agencies – Best Connection and Transline. Working conditions in depot are underpinned by a ‘six strikes and you’re out’ disciplinary procedure which have been described as ‘draconian’ and likened to a ‘workhouse’ by the union. Under the procedure agency workers can get ‘strikes’ for taking too long in the toilet, talking too much or even having time off for sickness. 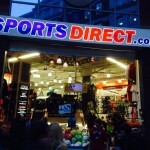 With latest figures for the Sports Direct showing a 7.4 per cent increase in gross profit to £1.155 billion, the union warned the retailer that it couldn’t plead poverty and needed to start weaning itself of its addiction to low paid zero hours work. Over 70 per cent of the workers in stores across the UK are on a low paid zero hours contract, according to latest estimates. 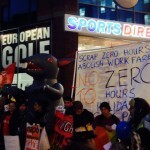 Commenting Unite regional officer Luke Primarolo said: “Agency workers on zero hour contracts are being subjected to working conditions at Sports Direct that are more akin to a workhouse than a FTSE 100 company. “These Victorian era work practices where workers eke out minimum wage living in constant fear of losing their job have no place in 21st Britain. 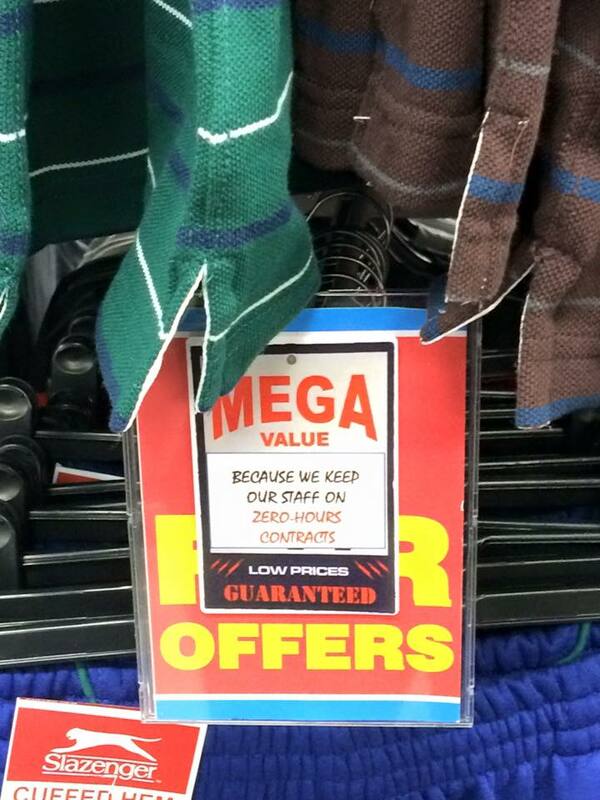 “Mike Ashley’s Sports Direct is generating massive profits and can well afford to wean itself off a business model built on low pay and exploitative zero hours contracts.